The conventional ignition system in a petrol engine consists of the battery, a coil, a distributor, a contact breaker (points) and spark plugs. Figure 1 shows an animated schematic of it. Apologies for the Roobarb and Custard movement in the distributor. The coil is a step up transformer which converts a low voltage into a high voltage. Electrical equipment which plugs into the mains will have a transformer which takes the mains voltage (240V in the UK) and drops it down to whatever is required - often around 20V. It does this by having two windings in it, a primary - with many turns - receiving the mains voltage and a secondary - with fewer turns - delivering the reduced voltage. The mains voltage is induced from primary to the secondary by electromagnetism and it works without additional aids because mains is ac - alternating current (or voltage). Transformers can only induce changing voltages across to the secondary. They cannot induce dc - as in a battery. The ignition coil is different from a mains transformer in that it is required to increase the voltage and also because there is no ac voltage it can use - only a battery. Increasing the voltage is no problem for a transformer - you just make the primary the one with fewer turns - and fortunately an ignition coil only has to produce a high voltage at particular times in the cycle, and not continuously like a mains transformer. All that is required is to make the voltage change when you want it to. This is where the points come in. One end of the primary winding of the coil is connected to the battery and the other end to one side of the points. The other side of the points is connected to battery ground (body of the car). This is called the low tension circuit. When the points are closed there is a constant 12V across the primary and when they are open nothing. While the points are opening the voltage drops from 12V to 0V which, for a little while, creates the required changing voltage. This allows a massive voltage to be induced into the secondary which is passed, via the rotor arm in the distributor to the relevant spark plug. you don't get energy for free from this system: the primary has low voltage but a high current flow and the secondary is the other way around. If the system were perfect primary volts x primary amps would equal secondary volts x secondary amps. In reality the primary side will be a fair bit higher. the condenser controls the discharge of energy across the points when they open and produces a much more even spark. one of the reasons for not leaving your ignition on with the engine not running in a car with conventional ignition is the points will probably be closed when the engine is stopped. Having the ignition on in this state allows the battery to send big amps through the primary which will heat it up and eventually burn it out (or flatten the battery). At the top of figure 1 are the pistons of a Beetle on the crank shaft looking down from on top. The bit of the engine nearest the back seat is at the top of the diagram. Piston 1 is green, 2 is blue, 3 is red and 4 yellow. Each has a spark plug shown to the left or right of the piston. 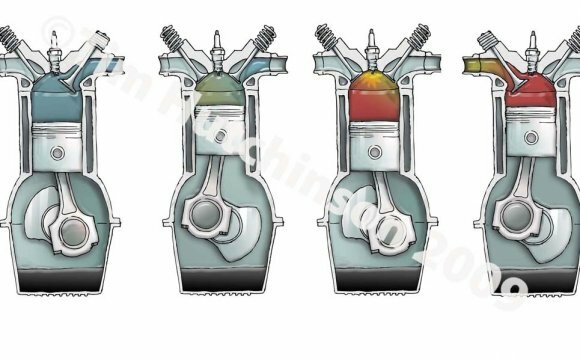 Below the pistons, in the middle of the diagram is the rotor arm in the top of the distributor. This is the 'high tension' side of the ignition where the high voltages are. Each plug is connected to the distributor via a contact which the rotor makes contact with once every other revolution of the crankshaft - i.e. the piston goes up and down twice but the rotor will only connect its spark plug to the high voltage once. The rotor arm rotates at half the speed of the engine. By the time it has gone round once the crankshaft will have gone round twice. At the bottom of the diagram is the cam to open the contact breaker points which is driven from the same shaft as the rotor arm. The colour of each lobe indicates the piston who's spark plug will spark when it opens the points. The coil and battery are also shown. Each piston receives a spark once in two revolutions of the engine but the coil produces two sparks per revolution as there is always one piston ready to fire each half revolution of the engine. In fact there is always one piston doing one of the four strokes - sucking air and fuel in, compressing the mixture, being forced down by the exploding mixture, exhausting the burnt mixture - at any one time. Two pistons rise at the same time. One is compressing and the other is exhausting. Two drop at the same time, one is inducing and the other is on its power stroke. The difference is down to the position of the inlet and exhaust valves at the top of the cylinder which must open and close at the right time as well. The engine fires the cylinders in a particular order. In this case it is 1 (green), 4 (yellow), 3 (red) and 2 (blue). This is chosen to even out the considerable forces the power stroke generates which tries to move the engine and twist it. One of the advantages of a horizontal engine like the Beetle's is that it can be short and you also have explosion forces acting in opposite directions. The shortness lessens twist (like trying to turn a tap or a door latch with the handle removed) and the opposition equalises the forces (like a pack of rugby players in a scrum). Back to the diagram: there are eight pictures in the animation. Four pictures show the pistons at the end of one stroke and the start of the next and the other four show the pistons half way through each stroke. Note the points are only open when the pistons are at the end of a stroke. In fact they might be closed by then as it is when the points begin to open that governs when the spark occurs and how long they are open the 'dwell'. Dwell is a measure of the timing and indicates how well the maximum gap between the points' contactors is set. The animation is slow to see properly what is going on in this image but hold the mouse over it and it will speed up which gives you a better idea of the relative speed of repetition in different parts of the cycle. In a real engine a spark is produced between 20 and 150 times a second. Lee Gunther (May 30, 1935—August 25, 1998) was a film editor (which, in animation parlance, means sound effects editor) on more than 85 animated shorts in all.